Ermine change their pelage from reddish-brown in the summer to pure white in the winter with the exception of the tip of their tail which remains black year round. Ermine have a typical weasel form with long body, short legs, long neck supporting a triangular head, slightly protruding round ears, and long whiskers. Their pelage is reddish-brown above and creamy white below in summer, and changes to completely white in winter with the tip of the tail remaining black in all seasons. Males are generally 25% to 50% larger than females however, the sexes of ermine on Haida Gwaii (M. e. haidarum) are more similar in size. 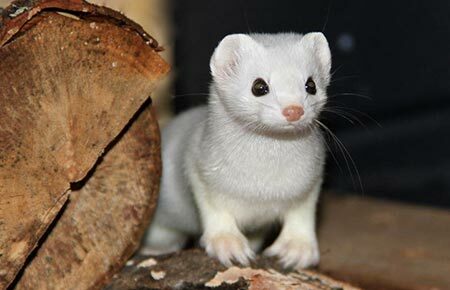 Ermine resemble the long-tailed weasel (Mustela frenata) in general appearance and coloration, but is smaller, has a shorter tail, and has white fur on the inner side of the hind legs. Least weasels (Mustela nivalis) are also similar in appearance to M. erminea, but are smaller and do not have any black on the tail. Ermine mate in late spring to early summer. Implantation of fertilized ova is delayed until early in the following spring, and once this happens there is a gestation period of about four weeks. One litter of four to 13 (average of six) young is born usually in April or May in North America. Females care for young alone. Lactation may continue until seven to 12 weeks, although young begin to venture from the nest at six to eight weeks. The nest is typically lined with rodent hair and is often a former burrow of a rodent, or may be in a rock pile, hollow log or crevice. Females are sexually mature at three to four months, while males likely reach sexual maturity at 12 months. Females may survive for at least two breeding seasons but males generally do not survive this long. Their reproductive success is highly dependent on food availability. Ermine are carnivores that consume mainly small mammals, especially voles (Microtus spp., Clethrionomys spp.) and mice (Peromyscus spp). Shrews and rabbits may also be taken and occasionally other small vertebrates and insects. Ermine foraging strategies are particularly well-adapted to northern environments where prolonged snow cover gives small predators, able to access under-snow tunnels, a competitive advantage, and where voles are the most abundant prey species. On Kodiak Island, Alaska, resident tundra voles (Microtus oeconomus) provide the bulk of ermine food supply, although these ermines have also been observed taking fish from a river. Ermine occur throughout Alaska from the mainland to islands in Southcentral and Southeast, excluding the Aleutian Islands. Recent reports of ermine occurrence on Evans Island, Prince William Sound and possibly other islands of Prince William Sound are not yet verified, but taxonomic status (likely M. e. arctica) and genetic characteristics of specimens from these locations may be distinctive. Ermine are adapted to a wide variety of habitats. It prefers wooded areas with thick understory near watercourses, and often occupies early-successional or forest-edge habitats, wet meadows, marshes, ditches, riparian woodlands, or river banks with high densities of small mammals and adequate subnivean foraging space. Coastal ermine may exhibit a preference for low elevation riparian and marine shoreline and estuarine habitats. They are well-adapted to snowy environments and range into alpine areas. They have been documented year-round living at 2,000–3,000 ft in the Sierra Nevada, California and also successfully inhabit tundra habitats throughout northern Canada and Alaska. Dens are located in hollow logs or under logs, stumps, roots, brush piles, or rocks. Snow provides vital insulation against extreme air temperatures. Males generally occupy a wider range of habitats than females and both males and females occupy a wider variety of habitat types during spring and summer than during fall and winter. Subspecies M. e. kadiacensis occurs throughout the Kodiak archipelago, which is dominated by Sitka spruce coastal forests on northeast islands, grading to tundra, alder and willow habitats on the southwest island. It builds dens in fallen logs, rock piles, or debris and has been observed throughout the archipelago, including areas of human habitation and is most often seen in tundra habitats. Subspecies M. e. seclusa has been documented in varied habitat including old-growth and successional forest, brush, alpine meadows, marshes, and riparian areas. Ermine population size is unknown but they are likely abundant. Populations likely fluctuate with cyclic populations of voles, their primary food source in Alaska. Potential threats include increased access and unrestricted trapping by humans, habitat loss and fragmentation, interactions with introduced species, and changes in prey availability. In general, mustelids are highly vulnerable to trapping, and not only to traps set specifically for them. Compared to other furbearers, ermine may be less threatened by habitat change from timber harvest or fire disturbances due to their preference for early-successional stage communities and aversion to dense forest. However, clear-cut logging may be a threat to this species in Alaska, especially in unproductive, mid-successional regrowth forests which may be favored habitat. 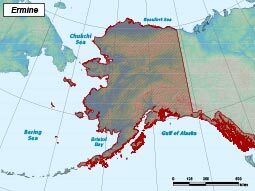 The restricted range of many Alaska subspecies increases vulnerabilities associated with all island endemics, such as susceptibility to disease, local habitat disturbance, extreme weather events, and changes in prey populations. The loss of genetic integrity and transmission of parasites and pathogens (such as canine distemper) from introduced or native stocks of other carnivores is also of concern. Mainly small mammals such as voles and mice, occasionally insects. Raptors, humans and other carnivores, including larger species of weasel. Breed once per year, females give birth to four to 13 young.